Line square baking dish, 8x8x2 inches, with aluminum foil, leaving 1 inch of foil overhanging at 2 opposite sides of pan; grease foil. Mix cornmeal and cold water in 2-quart saucepan. Stir in boiling water and salt. Cook about 5 minutes, stirring constantly, until mixture boils and thickens; reduce heat to low. Stir in onion, sage and 1/2 cup of the cheese. Cook uncovered 5 minutes, stirring occasionally; remove from heat. Spread cornmeal mixture (polenta) in baking dish. Cover and refrigerate at least 12 hours until firm. Heat oven to 400°. Grease jelly roll pan, 15 1/2x10 1/2x1 inch. Remove polenta from baking dish, using foil edges to lift. Cut polenta into 6 rows by 6 rows to make 36 squares. Cut each square diagonally to make 2 triangles; place in jelly roll pan. Bake uncovered about 15 minutes or until golden brown. Cut apple into thin slices. Cut slices into fourths. Dip apple pieces into lemon juice to keep them from discoloring. Top each triangle with 1 apple piece. Sprinkle remaining 1/2 cup cheese over apple pieces. Bake about 5 minutes or until cheese is melted. Serve warm. Use purchased polenta, and eliminate the preparation step in this recipe. Simply slice polenta, cut slices into fourths and bake as directed. Make and chill the polenta, cut into triangles and place in jelly roll pan. Slice apple, and dip into lemon juice. Cover and refrigerate polenta and apple slices separately up to 4 hours. Assemble and bake as directed. 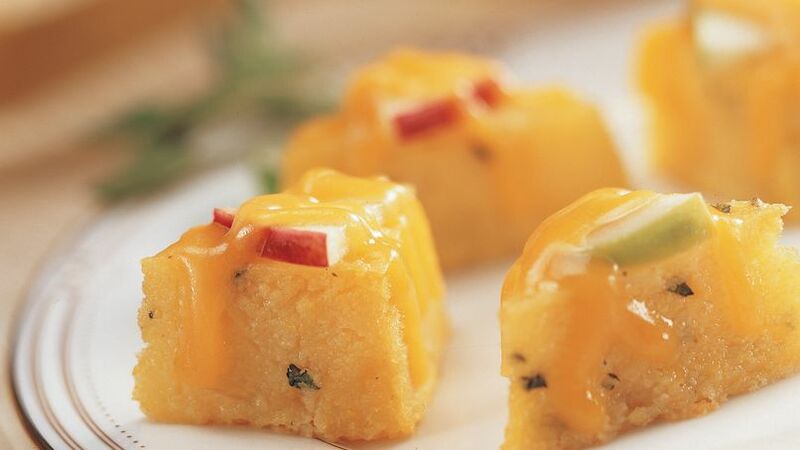 Arrange Cheesy Apple Polenta Bites on a colored serving plate, and garnish with fresh sage leaves and shaved fully cooked ham on the side.